Indometacin (often spelled indomethacin) is a Non-Steroidal Anti-Inflammatory (NSAID) drug commonly prescribed for acute gout pain. As with all NSAIDs, it is not suitable for long term use, so it is best used by gout sufferers as a short term measure to help them survive the early, often painful, stages of uric acid reduction treatments. Indometacin reduces inflammatory pain by reducing hormones that cause that pain, inflammation, or stiffness. It works by inhibiting prostaglandins, which are the hormones that cause these symptoms. Specifically, this is classed as COX-2 inhibition. However prostaglandins are also responsible for reducing injury to stomach linings, which is why NSAIDs are not suitable for anyone with digestive problems. Indometacin was discovered in 1963 and the U.S. Food and Drug Administration granted approval in 1965. Subsequent investigations into COX-2 inhibitors have caused the FDA to insist on warnings of heart and stroke risks, which rise with prolonged use. Though most new drugs are covered by brand names, older drugs, or where license has expired, are known as generic drugs, or simply, generics. Generics are subject to naming conventions to avoid confusion, unfortunately, confusion still reigns, especially in the multi-national world, as their are two lists. In the USA, all generics are listed by the United States Adopted Names Council of the American Medical Association. Their list is known as USAN, and this is the preferred list at GoutPal.com, as the majority of visitors are based in USA. The USAN spelling is indomethacin, but I’m including the alternate spelling on this page, as it is the World Health Organization (WHO) standard. In the UK, there used to be a British Approved Name (BAN) list, which was very similar to USAN. The UK has now adopted the WHO standard, which is called International Nonproprietary Names (INN). On this list, the correct spelling is indometacin. This spelling may also be included on other pages here, especially when I am quoting research work, which is increasingly adopting the INN spellings in most countries. Dosage will be determined by your doctor, and should never be exceeded. For maximum pain relief, your doctor may prescribe co-administration with other gout pain relief. 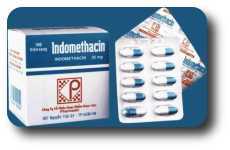 Please see the rest of the indometacin reference information.